Carrying ladders up ladders is one of those fun physical challenges that reminds me of when I used to be a rock-climbing fanatic. 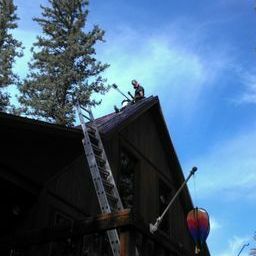 In most cases, I’ll carry the ladder with the hook up the first ladder, and hang it on the peak of a steep roof. Today I jumped at the opportunity to get on top of this A-Frame to clean the cap and chimney that serves a wood stove I delivered and installed years ago.